Basic mirrors are glass pieces that have silver backings and paint to protect them. The silver is formed by a reaction that happens on the glass’s surface to produce elemental silver in a thin layer. Over time, the silver backing may become damaged, and many people do not know how to restore an antique mirror. 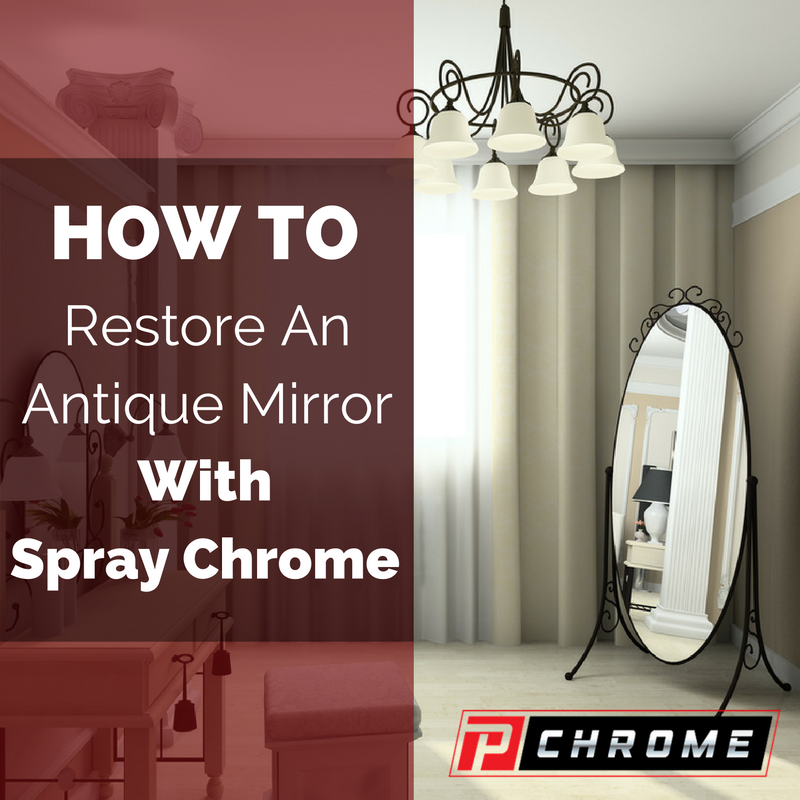 You can restore an antique mirror with a spray chrome paint system by following these simple steps. Mix together some pumice together with some distilled water to form a paste. Using this, smooth out the edges. Next, you will need to clean the surface thoroughly, smoothing out all rough spots with your pumice mixture and then thoroughly rinsing it clean with distilled water. Your kit comes with four chemicals that are labeled S, D, R and W. For the S, D and R solutions, you will mix together 1 part of each with 30 parts of deionized water. The W solution will be mixed in a ratio of 4 parts of W solution together with 30 parts of deionized water. You should mix together one part of your Permalac 2KA together with one part of your Permalac 2KB. To this mixture, add 20 percent of your 2K black reducer. Using your spray gun, spray the base coat mixture on the surface using even, back-and-forth sprays with fine atomization. The base coat will take approximately 24 hours to cure. Make certain to clean your spray gun with acetone. Spray a liberal coating of your prepared W solution on the surface. Then, use your D solution with your single-nozzle spray gun to thoroughly spray the surface. Rinse it off with deionized water. Repeat the applications of W and D solutions, and rinse thoroughly with the deionized water again. Do not let it dry before moving on. Feed the prepared S and R solutions into your dual-nozzle spray gun. Working your way from the bottom of the mirror’s surface to the top, spray the solutions using quick and light back-and-forth motions. Continue applying from the bottom to the top until you have achieved the degree of reflection that you want. Rinse the new finish with deionized water. Allow this to completely dry before moving forward. You can use an air gun to dry it more quickly. You should not leave any water droplets behind. The final step is applying your protective coating. To do this, you will mix together one part of your Permalac 2KA together with your 2KB in equal parts, and then add 20 percent of your clear reducer. You will also want to add 1 milliliter of violet for every 125 milliliters of your solution to prevent a yellowed appearance. Apply this solution to your surface using quick spraying motions, again working your way from the bottom to the top. Allow this to dry for 48 hours. You can apply a second topcoat if you wish. Restoring an old mirror with spray chrome will take some practice. You might try silvering an old piece of glass before silvering your antique mirror. When you follow these steps, your mirror will appear just as it did when it was new. Order your PChrome starter kit today on our website. The PChrome Spray Chrome System creates a mirror-like finish that achieves all the high gleam shine of traditional chrome plating with none of the hassles.